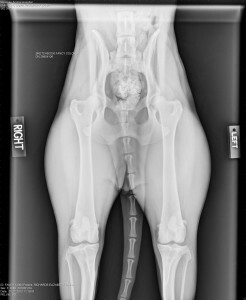 Hip dysplasia is known in the Picard however early detection and proper long term care can help prevent the normal crippling effects. According to the responses from our health survey, most Picards are not dysplastic and are able to be active with their owners happily into their old age. Larger breeds of dogs in general are more prone to hip dysplasia which is why responsible breeders evaluate their breeding stock’s hips after the age of two and prior to breeding. Some breeders choose to have their dogs’ hips checked by PENN hip method, which requires anesthesia and can be done as early as 4 months of age. The gold standard remains OFA certification which involves a well positioned x-ray of the hips which can be done very quickly by an experienced vet , and the results sent into OFA for a final review by three board certified canine veterinary radiologists. Responsible breeders will always publish the results on the OFA website so that they can be seen not only by potential breeders but to puppy buyers as well. That way decisions can be made regarding breeding stock or for correct puppy placement. Elbow x-rays often are done at the same time as the hips with results sent into OFA . So far only a very few Picards have had elbow problems. A few Picards have suffered from osteochondritis dissecans which can effect elbows or shoulders of younger dogs when it is present.